Every year at Christmas I get out my embossing gun, stamps, cardstock, and the other hoards of card making supplies I have for my annual card making. For the past two years, I've even hosted a Card Making Party. I thought - why not expand card making beyond just my Christmas cards this year? 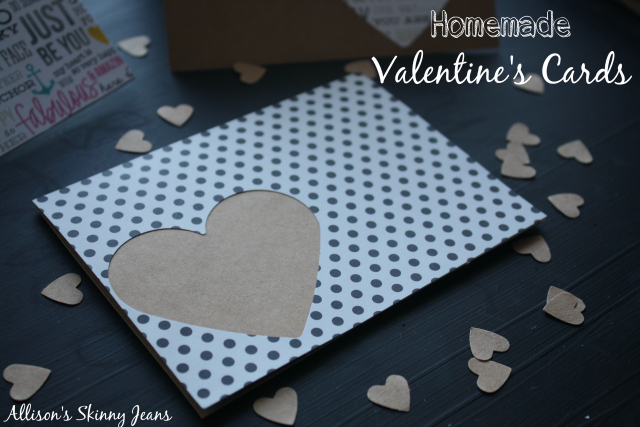 Nothing says LOVE more than homemade! I hope these card ideas give you some inspiration! 1. Pick paper that coordinates. 2. Use the card as a stencil to measure the paper that will go on the inside of the card. Use double sided tape to adhere it. Trim if necessary. 3. Using the heart punch, punch out a heart from the actual card towards one side. 1. Pick your favorite paper! 2. Use the card as a stencil to measure the paper that will go on the front of the card. 3. Punch a heart out of the paper using the heart punch. Use the double sided tape to adhere the paper to the front of the card. 4. Stamp words inside if desired! I used the heart I punched out of the patterned paper to make another card! A crafting rule of thumb is to never throw away scraps - they can always be used. I have a whole crate of scrap paper in my craft room. There are so many variations you could do with just some cute paper and the heart punch! What's your favorite? Super cute project!! Love it!